Gravlax or gravlaks is a Nordic dish consisting of raw salmon, cured in salt, sugar, and dill. 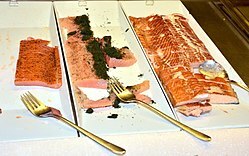 Gravlax is usually served as an appetizer, sliced thinly and accompanied by hovmästarsås (literally "maitre d'hôtel sauce", also known in Sweden as gravlaxsås and in Denmark as rævesovs, literally "fox sauce"), a dill and mustard sauce, either on bread or with boiled potatoes. During the Middle Ages, gravlax was made by fishermen, who salted the salmon and lightly fermented it by burying it in the sand above the high-tide line. The word gravlax comes from the Scandinavian word gräva/grave ("to dig"; modern sense "to cure (fish)") which goes back to the Proto-Germanic *grabą, *grabō ("hole in the ground; ditch, trench; grave") and the Indo-European root *ghrebh- "to dig, to scratch, to scrape", and lax/laks, "salmon". Fermentation is no longer used in the production process. Instead the salmon is "buried" in a dry marinade of salt, sugar, and dill, and cured for twelve hours to a few days. As the salmon cures, by the action of osmosis, the moisture turns the dry cure into a highly concentrated brine, which can be used in Scandinavian cooking as part of a sauce. This same method of curing can be employed for any fatty fish, but salmon is the most commonly used. Gravlax can be cured with salt, dill, and beetroot, and it is often eaten on rye bread. ^ "Gravlax Cured With Dill". YouTube.com. ^ "Gravlax Cured With Dill on Rye Bread". YouTube.com. ^ "Gravlax Cured With Beetroot on Rye Bread". YouTube.com. Ruhlman, M.; Polcyn, B. (2005), Charcuterie (1st ed. ), New York, NY: W.W. Norton & Company . Look up gravlax in Wiktionary, the free dictionary. 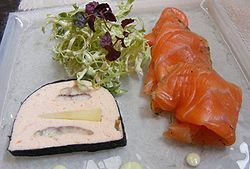 Wikimedia Commons has media related to Gravad lax. This page was last edited on 6 January 2019, at 16:28 (UTC).